If you’ve stepped outside today you’ve noticed it’s a really cold day! 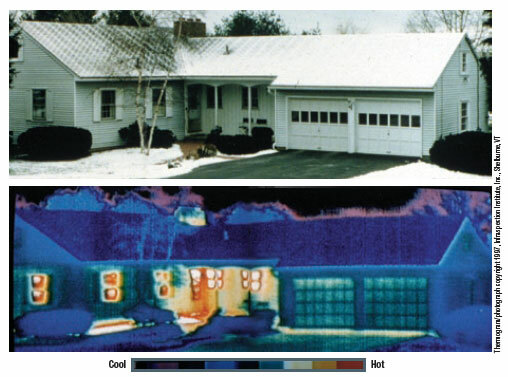 This photo from the US Dept of Energy website showing where heat leaks from a house in cold weather. The white yellow and red are the areas of heat loss, with the red being the biggest problem area. Look at those windows and doors! ABC Seamless windows have slashed energy bills for hundreds of homeowners in Elizabeth City, Hertford, Edenton, Camden, Currituck, and the Outer Banks of North Carolina. If replacing all of your windows isn’t in your budget, we have many customers who replace their windows a few at a time. If you can’t afford to replace your windows, you can tape clear plastic film to the inside of your window frames during the cold winter months. Remember, the plastic must be sealed tightly to the frame to help reduce infiltration.